Zeiss Conquest HD 10×42 Binoculars Review: As good as they say? When it comes to the binoculars industry, Zeiss is one of the most respected brands. In fact, many consider Zeiss to be the “Holy Grail” of binoculars. There are solid reasons why so many individuals have invested in the Zeiss Conquest HD 10×42 binoculars. The Germans are well known for their design, engineering and manufacturing skill. Let’s find out if they delivered with the Zeiss Conquest HD 10×42. One of the finest pairs of entry-level binoculars that you will find are the Zeiss Conquest HD 10×42. Zeiss is well aware that these thousand dollar plus binoculars are not for everyone. For those who want the best, Zeiss is the brand to consider.The Conquest line is worth the price tag if you are looking for the best binoculars that money can buy. What makes the Zeiss Conquest so special? When it comes to this manufacturer, it is clear to see that every single feature is planned in detail. You do not become the leading binoculars manufacturer in the industry by relying on your name. Zeiss creates new breakthroughs. Well known for pushing technology forward and their innovation. They leave all other brands scrambling to try to keep up. The Conquest HD 10×42 Binoculars is the first premium Zeiss binoculars priced below $1000. For comparison, check out the Zeiss Victory range of binoculars all priced over $2000. Some might think it ridiculous spending more on binoculars than their mortgage. Zeiss understands this dilemma well. That is why the company created the Conquest HD range. An entry-level solution for its premium binoculars line. Without reducing the quality and workmanship you enjoy from a pair of Zeiss binoculars. If you think it sounds ridiculous spending this much on a pair of binoculars, these aren’t for you. The Conquest HD is for those who appreciate quality and workmanship. As soon as you peer through these binoculars you will understand why there are so many Zeiss fanatics. Individuals that won’t consider looking through anything but binoculars made by Zeiss. The high definition quality that these lenses produce is absolutely stunning. It makes you wonder if some kind of magic is inside of them. The Conquest range delivers stunning picture quality in any type of lighting situation. It produces sharp image tracking you will be able to use if your subject blurs past you or takes flight. The 10×42 lenses will allow you to get up close and personal with your subject. Even if you are hundreds of yards away. You have the ability to zoom out quickly and the ability to take in the surroundings with more of a landscape view. This type of technology appears in many other binoculars. None of them produce that same crystal-clear picture provided by the Zeiss Conquest HD. When it comes to full frame binoculars, it would be hard to find a more portable set that can. This product weighs less than 8 ounces. You won’t have any problem at all having it hang from your neck for many hours at a time. Or stuck to your hands when you are on a day-long bird watching trip. Zeiss has taken full advantage of the many principles they have been able to learn over the many decades of the company’s existence. Zeiss have worked closely with various military forces. This helped them produce picture quality of the highest order in battle ready binoculars. When you hold these binoculars in hand, it is hard to believe that they can produce such clear images. 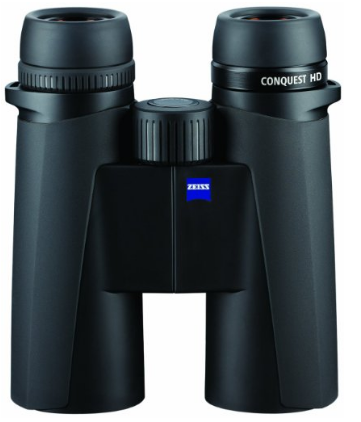 Far and away, Zeiss provides the gold standard in construction for the binoculars world. The Zeiss Conquest HD 10×4 Binoculars are no different. Only the absolute finest construction materials are used. These binoculars offer long-term use, reliability and durability. When investing in a pair of Zeiss binoculars, you get exactly what your money is paying for. You get binoculars made according to high standards, which few other (if any at all) companies can match. You also get a product utlizing made of cutting-edge materials. This produces an unparalleled weight to strength ratio. The lenses are high density and produce sharp pictures without adding unnecessary weight. Everything fits together well, and fog or water worries are something of the past. It’s hard imagining a situation where it wouldn’t be handy to have the Zeiss Conquest HD in hand. Bird watchers will love them for the quick zoom. Ideal in situations where you need to transfer from a broad range approach to close quickly. Outdoorsmen and hunters will love the lightweight construction. Coupled with the HD clarity and high density, these will give you the edge when hunting. For anyone who is serious about having the finest optics, these are a great option. Perhaps you have always longed after a pair of Zeiss, but wasn’t prepared to spend $2500 on a pair. The Conquest HD comes in at less than half of that price, and still offers the same qualities. These Zeiss binoculars are super lightweight and picture-perfect. They are the binoculars you have always dreamed of having, and they won’t break your bank. Sure, these are expensive. But when it comes to image, quality and engineering, very little can beat them. Except perhaps for the Victory range also made by Zeiss. But those come at more than double the price. Whenever you want the absolute best, you just cannot settle for anything less. Don’t be surprised if you end up falling head over heels for these.